Making My 11th Doctor Costume: Greatcoat - finished! Cutting the pattern and making the cuff vent was quite challenging, but after doing those on the tweed jacket, I understood the principle. The problem, however, was the need to flare the cuff, which gives sharp angles on the vent corners. I drew the pattern very carefully, so it wasn’t too much of an issue – I just had to keep my wits about me. 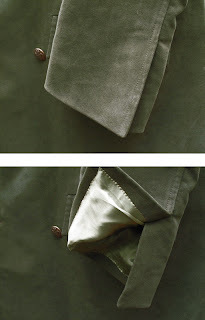 Although the cuff is vented, it doesn’t have any buttons or buttonholes, which is unusual. The rear and front storm vents went well, as did the pockets. I designed the coat to properly fasten double-breasted (see below, top left), though we haven’t yet seen The Doctor wearing it this way. 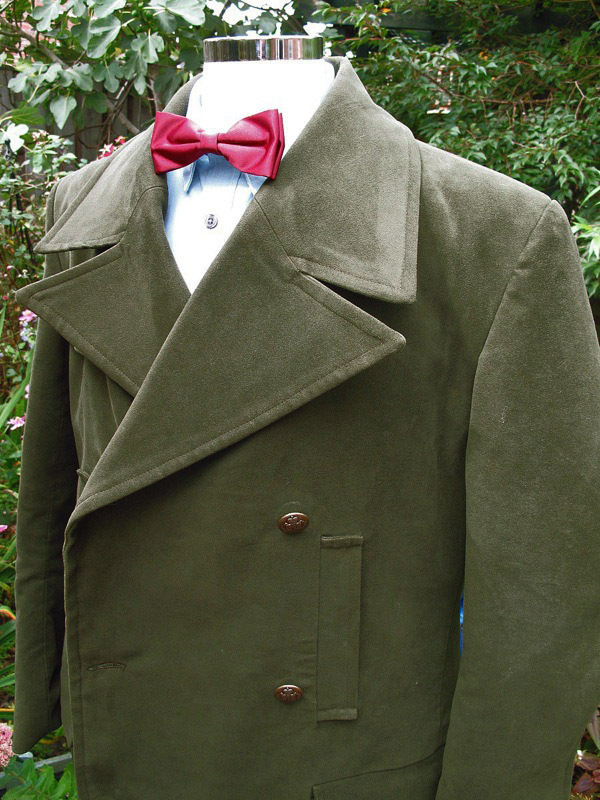 I think it’s a bit more practical than a Tennant Coat. Being knee-length it doesn’t look unconventional and it will be nice to have a coat that can be properly done up. With winter coming, I’m looking forward to wearing it out and about. and I can answer any questions you might have. That looks ace. Yet another perfect piece from you. Is there anything you can't do?? That looks great. I'm impressed how quickly you designed and produced it. That's a brilliant coat - I'm also baffled by how great you do the designs and the final results! It is brilliant! Steve, you are a tailoring genius. Absolutely stunning final product. 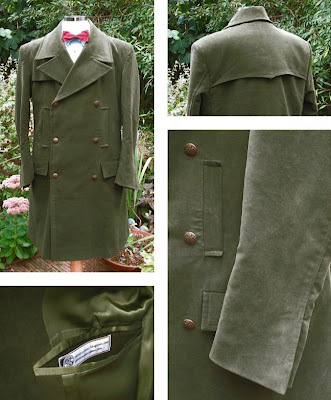 Now that's a coat to wear out and about and looks just as good done up as open. Here's some pictures of Matt fastening up the coat in last weeks 'Confidential'. I didn't comment on this? I was sure I had. I love it. You amaze me with your work every time. Curious question Mr Steve; Are you finding the 11th Doctor's clothing easier to replicate, in say, comparison to something such as the 10th Doctor's coat? I've noticed he has a lot of things that you're able to jump right on, whereas Tennant's coat was evil in the details. @drakes @atom @cecil h @nicole @peter lack - thanks for the comments guys. It's hard work, but I getting into the zone of seeing what I need to achieve and the way to get to it quickly and efficiently. @anon (luke) - thanks for the links to the photos - very useful. @benjamin rudman - very good point. I feel a posting coming on about that. What do you think? Really impressed by this, keep up the good work! Fantastic work. Will you be creating more replicas to sell? 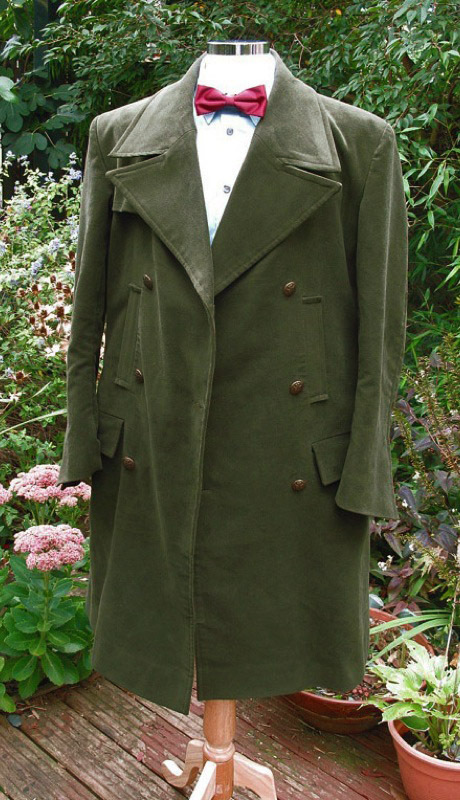 If not, did you come across any similar coats for sale on the Internet as I haven't been able to find any. I thought I posted on this too! Much appreciation for your work! Great! How would you like Eleventh's costume to evolve next? And how about some kind of "competition", just to take time before next air of "Doctor Who" next autumn? Well, as far as we know, Doctor's costume is one and the same in general. He can change shirt, trousers, boots, take a jacket of differnet pattern (still tweed, "tweed is a king", as Matt said in "Confidential"), adopt some hat (any hat!) - and it still will be his costume. So, what if fans of Doctor's suit and your blog readers would "build" their version of Doctor's possible costume from these items? And you can choose the best! Are you planning on make more to sell? How much would one of these cost to commison? That looks great! Fantastic! Brilliant! etc. How long did it take you to make it? It looks like Magnoli Clothiers has a replica,http://www.magnoliclothiers.com/smith-peacoat-overcoats-p-457.html, at a cheaper price, but it doesn't look as good. Well its not even in moleskin for starters, so it can't be as good. A lot of the details are off too, with things cut too high or wide. Is there any chance you would sell the pattern to an individual who would like to make their own?